FOREO is the Stockholm-based beauty company taking the world by storm with its range of innovative sonic cleansing devices, the LUNA and LUNA MINI. FOREO uses groundbreaking technology to create unique products that are being raved about by beauty editors across the globe. 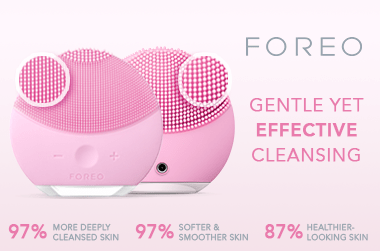 FOREO provides a smarter and more effective way to care for your skin. The promise is simple – FOREO is here to give you a new-found confidence, through innovative skincare that works. Foreo LUNA offers total beauty care, combining sonic cleansing with anti-ageing benefits. The Foreo LUNA mini is a simpler device that offers deep, gentle cleansing for all skin types. Foreo LUNA for men is the ultimate in pre-shaving care. this is such a good gadget to invest it. i feel like this really helps me clean my skin thoroughly! love that it is not the bristle type head. love that it is silicon like. wish i purchased this in the larger size though. I've been using my foreo for over 6 months and my breakouts have gone down so much! my chin used to be covered in bumps and this has helped me reduce them. so happy with this purchase. At first I was hesitant about the price point but this has become an everyday staple for me! I'm shocked by how soft and gentle this is. I will use this every now and again as it's lovely and relaxing to use but I am worried about irritating my sensitive skin too much.